Every year as soon as Passover ends, the Yoms begin, Yom HaShoah, Yom HaZikaron, Yom Ha’tzmaut, and Yom Yerushalyim. After remembering the victims of Holocaust, fallen IDF and terror, then celebrating Israel Independence and the unification of Jerusalem begin. Flags come out. Jerusalem goes blue and white. 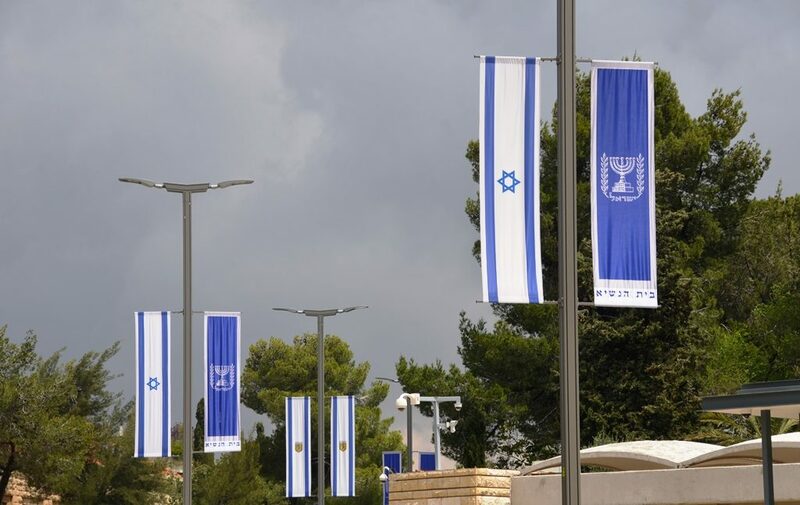 Official flags of Israel, Jerusalem and Beit Hanasi, the President’s House are displayed. But also some private residences get into the holiday spirit. Cars, taxis, and motorcycles can be seen flying small flags. 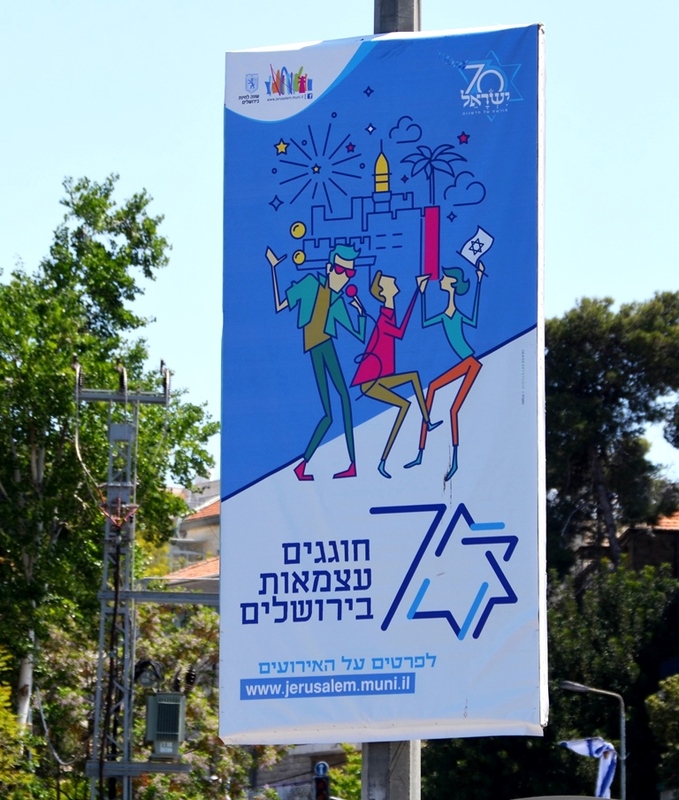 There are new signs in Jerusalem for celebrating Israel’s 70th lining some streets. 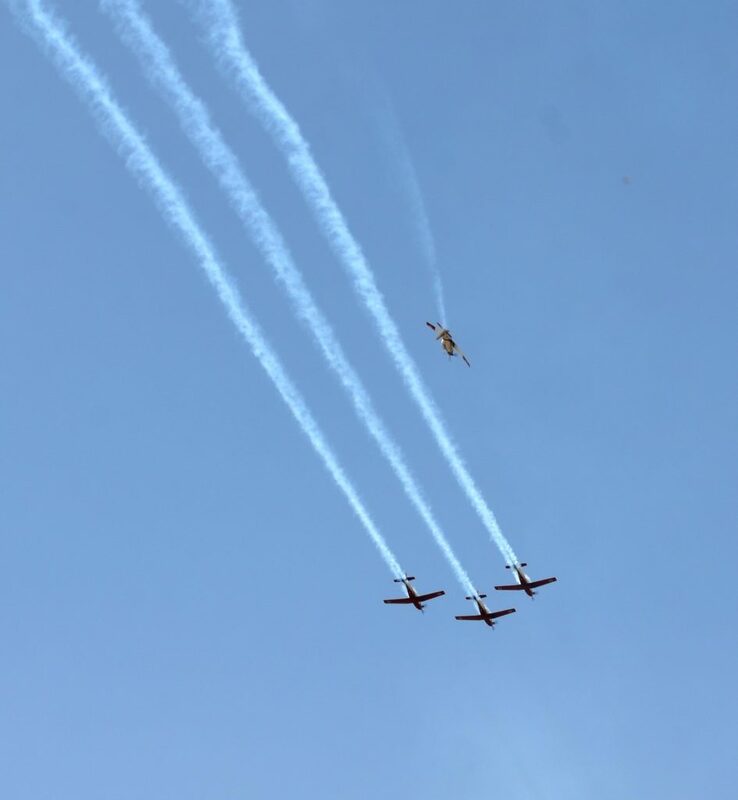 The practices for Yom Ha’atzmaut air show have taken place over several days. It is one of my favorite times of year. This year I got some of it on video to share with you. The show seems bigger this year. 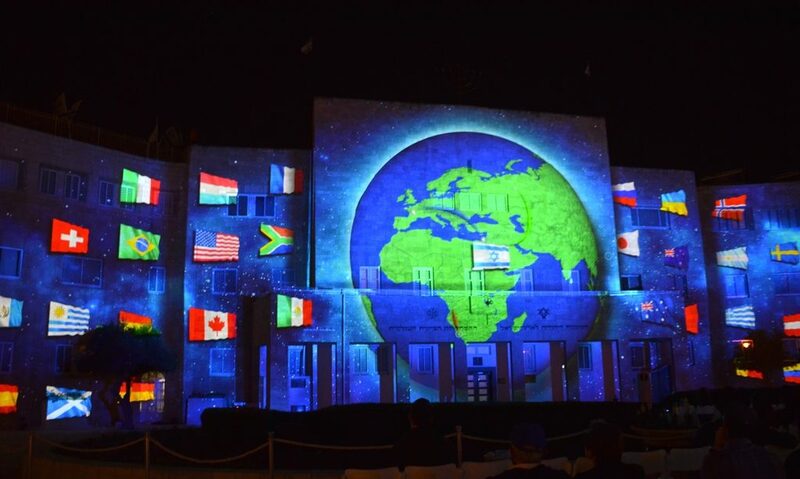 Everything seems bigger this year for Israel 70. 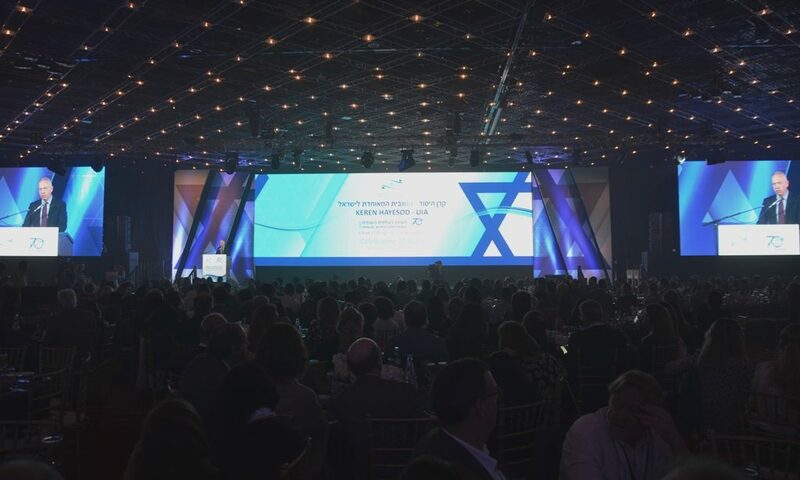 The annual World Conference of Keren Hayesod-United Israel Appeal had over 1000 people at its opening gala dinner in the Jerusalem International Conference Center. From all over the world they came, so many from South America, I thought the event should have been done in Spanish, instead of English. But all is not just blue and white, yellow roses are in full bloom, as are purple flowers and more. Perhaps a whole blog again of Jerusalem colors? 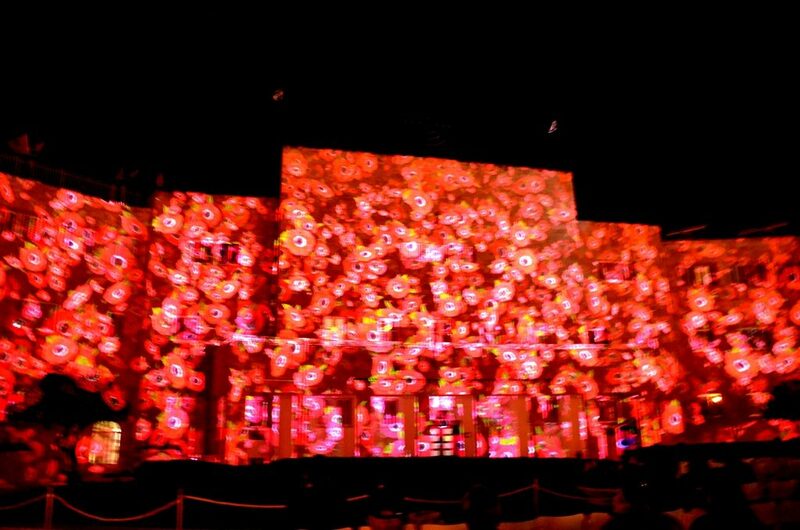 These red flowers on the Jewish Agency Building are part of a light projection video by JNF in honor of Israel 70. Seats were set up in the plaza for public viewing. Jerusalem is too often under a magnifying glass, maybe we get more attention than is desired. JNF supporters are found around the world, country flags highlighted in this photo from the video. 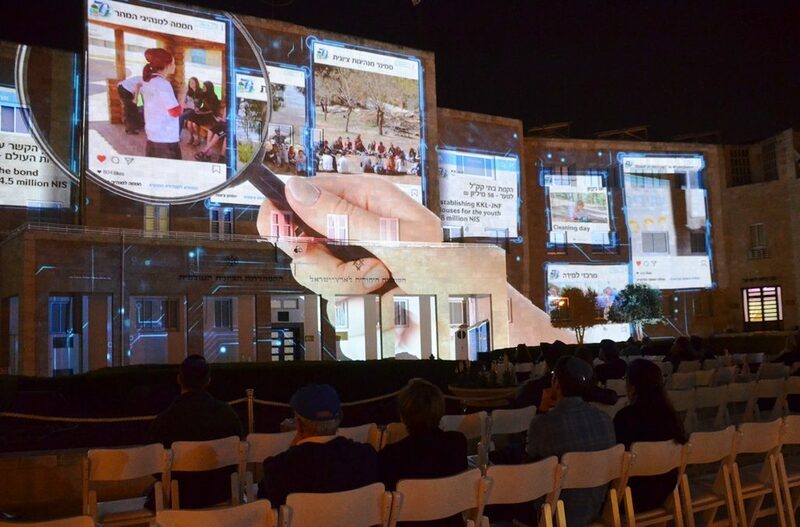 The projection is scheduled to be seen only nights this week, so I recorded part of the video to share with you. 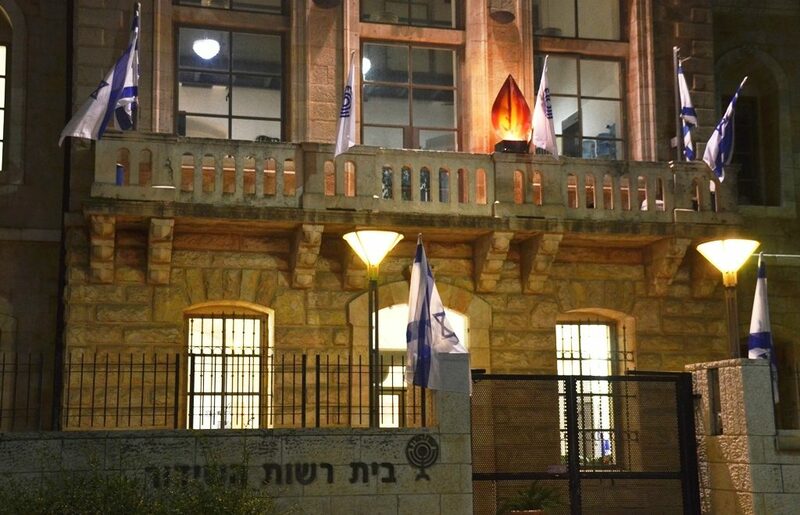 State celebrations for Independence Day will begin on Wednesday night with a torch lighting ceremony at Har Herzl. I plan to attend and share highlights as usual. But first along with the blue and white flags, memorial flames are found on many buildings. Before the celebrations begin, we remember the fallen defenders of Israel and victims of terror. The state televised ceremony is held at the Kotel, Western Wall. Communities throughout Israel host their own. 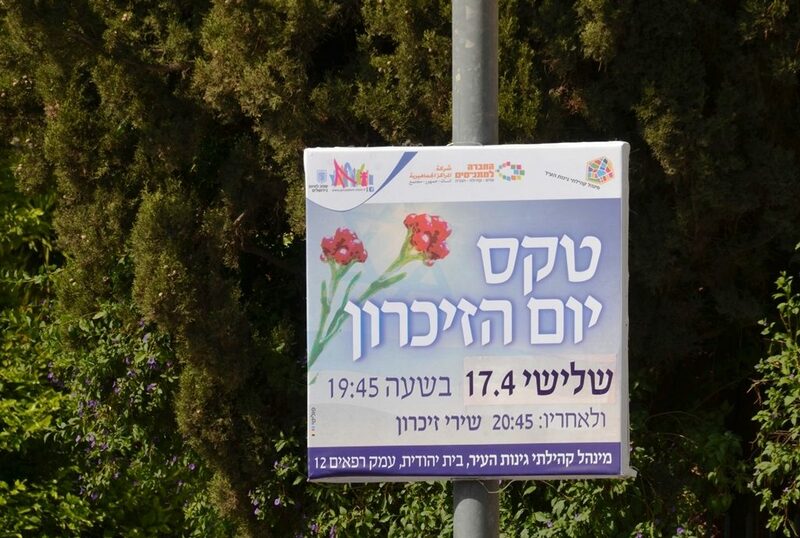 I am planning to be at a ceremony at Givat Tachmoshet, Ammunition Hill. Near the memorial for fallen lone soldiers, an event sponsored by lone soldiers. Young men and women who come from around the world to serve the Jewish people and State of Israel. We live in momentous times. The founders of modern Zionism did not say that the attacks on the Jewish people would seize once we establish a Jewish state. They said that we could defend ourselves against those attacks. And that’s exactly what the State of Israel has done. It’s restored the capacity of the Jewish people to defend ourselves, by ourselves, against any threat. And we are as powerful as we’ve never been before. We will mourn the fallen, then we will celebrate the living and life. Thanks for enhancing our Aliyah year with your beautiful photos of this special time of year!! Thank you. 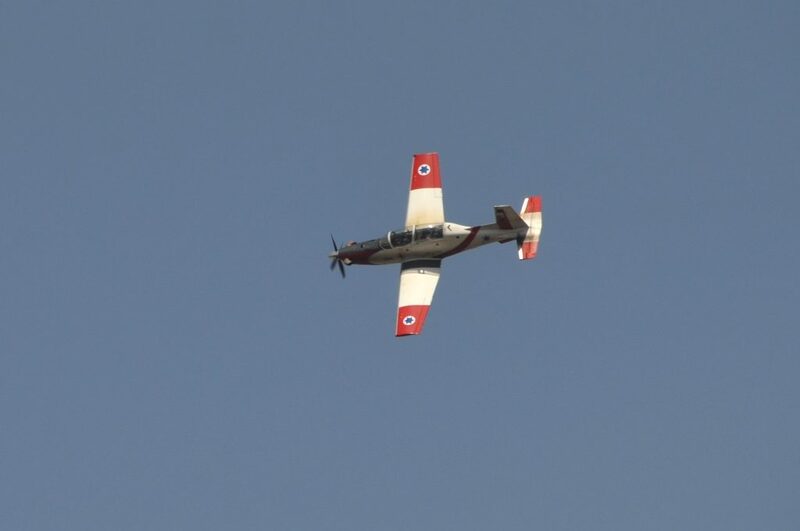 Hope you enjoy Yom Haatzmaut!